This specification sets up requirements for the design, materials, manufacture, and construction of precast, reinforced concrete retaining wall system.Contract work consists of furnishing materials and installing retaining wall in accordance with details shown on project plans. Bidders attention is called to the fact that EVERGREEN retaining wall units are the basis for this specification. Resets: Using smaller elements on top of wider elements produces offsets, which will be either on the front side or on the rear, depending on specific wall design. This configuration contributes to improve structural integrity and safety at each joint. In cases, planting is desirable at intermediate levels; such horizontal resets at the outer surface provide rooms for plants and improve plant growth. Topsoil: In case of planting such resets are to be filled with 8 to 10 inches of topsoil, preferably enriched with nutrients to expedite plant growth. Design of Units: Evergreen wall components are specifically designed and manufactured for each individual application. 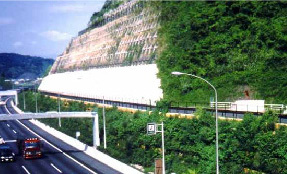 Site-specific soil design parameters and traffic loads directly affect the size of Evergreen Maxi units and required steel reinforcement.The Evergreen franchise includes in-depth Evergreen computer design software and trained staff engineers for specific design of each wall section. Specific Location of Units: Each type of units is reinforced for resisting a certain range of loading conditions and position of unit beneath the crest of the wall, to be verified by the designer. In most cases, these units are reversible. However, in case of specific design, heavier steel reinforcement may be necessary. In case of wall corners or turns in the alignment of the wall, front panels must be shortened to fit. These units are to be marked individually at the time of manufacture indicating number of stack and number of layer to fit.